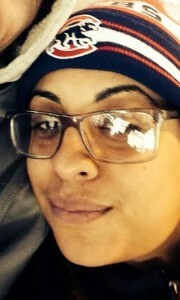 Zoraida Feliciano, 33, of Humboldt Park. Photo courtesy Feliciano family. A family gathered Monday to grieve a mother that was senselessly shot and killed outside her home over the weekend. The fatal shooting happened Saturday evening. Zoraida Feliciano, 33, was sitting in the passenger seat of a Chrysler SUV parked outside of her home in the 3700 block of West Potomac. She was waiting for her boyfriend, Julian Lopez, to return from inside the home with one of her daughters, who was feeling sick, the family said. Around 6:45 p.m., as Lopez was getting out of the SUV, a white car pulled up next to them, police said. “A black guy got out [of the car] and started shooting,” said Lopez. A bullet hit Zoraida Feliciano near her ear and she slumped forward and the shooter went back inside his car and fled westbound on Potomac, said a police report. Lopez rushed to the SUV and started driving his girlfriend to Presence Saints Mary and Elizabeth Medical Center. He crashed at Division and California, about a mile away from the hospital. Lopez wasn’t hurt in the crash and when an ambulance arrived it took Zoraida Feliciano to Stroger Hospital, where she arrived in critical condition. Leslie Feliciano said doctors told the family her sister was brain dead late Saturday night and the family decided to discontinue life support. The mother of two was pronounced dead on Sunday at 1:03 a.m., said the Cook County Medical Examiner’s Office. Zoraida Feliciano’s family described her as someone with a beautiful smile who was loved by everyone that knew her. She’d been working as a Walgreens pharmacy technician for the past three years and was raising two daughters, ages 7 and 13. Police described the shooter’s car as a Toyota Camry. However, family members told EXTRA the car looked more like a Nissan Maxima or Infiniti. Moreover, they said a second red car, possibly a Nissan 350-Z, might also have been involved in the shooting. “We just want someone to come forward to say something if they saw what happened,” said Lopez. Police News Affairs Officer Jose Estrada said the shooting might be gang related, as there is a gang conflict in the area. At press time, no one was in custody and Area North detectives were still investigating. Earlier on Saturday, another fatal shooting happened in the 700 block of North Hamlin around 2 p.m. The victim was identified as Anthony Jackson, 22, of the 300 block of West Lexington, by the medical examiner. Police say that after Jackson was shot, he drove into several parked vehicles before coming to stop. He was pronounced dead around 3:02 p.m. at Mount Sinai Hospital from a gunshot wound to the chest, said the medical examiner. “No one is in custody at this time and because the victim is a documented gang member, it was possibly gang related,” said Estrada. And on Saturday, around 11:50 p.m., an 18-year-old was shot in the right hand while in the 3900 block of W. Armitage. The victim was able to walk into Mount Sinai for treatment and give police a statement. “He was sitting in the driver’s seat of a vehicle and someone approached him and shot at him from the sidewalk,” said Estrada. Police say the incident may also be gang related and Area Central detectives were still investigating at press time.